Find hotel near Canmore Golf & Curling Cl ..
Canmore Golf & Curling Club is a lovely golfing course located in Canmore and offers 360 degrees of “wow” views. A local treasure, this club was established in 1926 and was funded by the residents of Canmore. With a mission to provide the best quality golf and curling opportunities, this golf club has 18 holes, clubhouse and curling rink. Wonderful venue with a great staff. Everyone was helpful and did an amazing job setting up for the wedding. Size would be the only issue I would have with this venue. The food was great and 80 people had meals and were seated within 10-15 min! We went in December and used the golf simulator on the pro shop! It was awesome and fairly realistic, you could even hear the birds chirping on the course we played. They rented us clubs and you could even order some drinks from the clubhouse. Bill was great and even gave us some tips while playing the simulator course. Great way to work on your game in the winter. Full disclosure: I am a former employee. My return after an approximately 10 month absence was nothing short of spectacular! I had arranged through my Mom, who is a long-term member, for a foursome on a Saturday afternoon of the Father's Day weekend. Although the weather appeared to be against us that day, it did not dampen the spirits or the enthusiasm of the entire crew. I/we were greeted warmly and sincerely. I was witness to not one, but two wedding ceremonies while we were there. Judging by the smiles, both went off without a hitch. While we did not eat there this time, I was impressed with the beverage selection, service provided and price points. It still remains the best value in the Bow Valley and surrounding area for course condition and spectacular views. Pace of play is strictly adhered to and made it possible for us to fully enjoy our day! A special shout out to our Starter Steve Williams who arranged a blue flag for my mother "just in case". The Director of Golf took the time to greet my party in the Pro Shop and introduce me to current staff in a warm and friendly way. 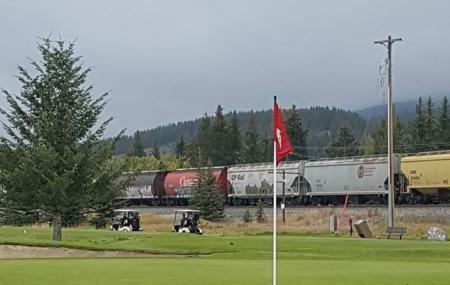 I now live in Winnipeg but when in Canmore I relish the opportunity to play this course regardless of the weather! Thank you to all and I hope to see you again later in the season.